In the accompanying video, you will be able to watch the President of the United States advise viewers of an interview to encourage Illegal Aliens to vote. He then promises them, in the interview, that there will be no repercussions if they vote illegally—a violation of US Federal Voting Laws. 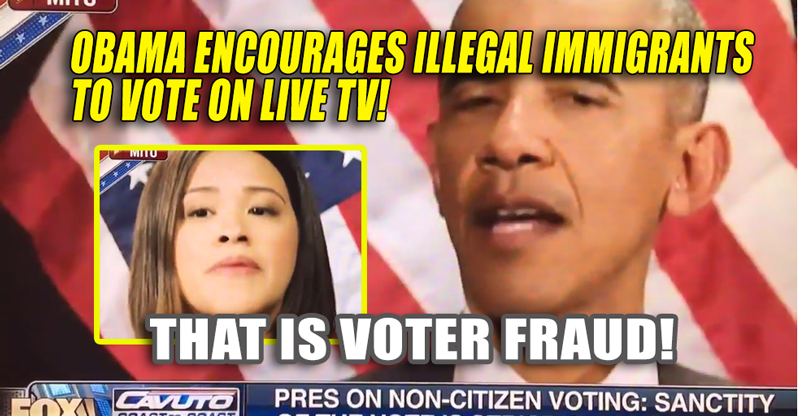 Obama is the first occupant of the Oval Office in 240 years to encourage Illegal Aliens to vote, while assuring them that there will not be any repercussions for voting illegally. Why is there no outrage? Why no impeachment? Donald Trump is arguably the only presidential candidate ever to be openly targeted by his own party’s (GOP’s) establishment, the entire Democratic Party, super-rich leftist organizations complete with their underground cash-dispersal system, and the mainstream media all at the same time. Yet Trump isn’t backing down and in fact he’s telling his supporters — and undecided voters — that the current election process is a “rigged” system. He has focused his argument on the fact that voters only chance to defeat the “rigged” system is by electing him. 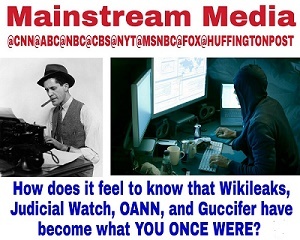 More and more Americans are realizing the news media has become as corrupt as the people they once exposed. Wikileaks documents lifted from the Internet servers of the Democratic National Committee and from individuals, such as Hillary for President Campaign director John Podesta, when released by Julian Assange gave an unvarnished look at the DNC and Clinton political machines. Wikileaks document dumps also suggest that the Democratic Party ranks are rife with voter fraud and those eager to protect the status quo. Add the recent videos released by ‘take-no-prisoners” investigative journalist James O’Keefe — videos that have Democratic operatives bragging about their unethical at best, criminal at worst, activities — and it’s no wonder conservatives are suspicious. It wasn’t that long ago when conservatives watched in shock as the Internal Revenue Service (IRS) and certain Democratic Party officeholders targeted Tea Party groups and other right-of-center organizations that were seeking only their rightful tax-exempt status. Not one person at the IRS has been arrested let alone prosecuted for unlawful acts committed by a government agency against its own people. While conservatives are accused of being infatuated with the Second Amendment (guns) liberals owe their allegiance to the Fifth Amendment (remaining silent to avoid incrimination in an illegal act). Now with millions of Americans repeating Trump’s words — “The system is rigged” — the left is seeing that denying it is useless after all of the evidence was made public. Now they are saying this type of talk is “dangerous” to the integrity of our electoral system. They are even ridiculing Trump and asking him to prove his voter fraud allegations. The argument isn’t whether voter fraud is real, but how widespread it is and will Americans follow: “If you see something, say something.” Below are the phone numbers for the authorities in each of the 50 states that citizens can contact to complain about irregularities seen or heard while visiting the polling stations during the elections. Provide all the information you have and don’t worry about “profiling” or any other restrictions placed on cops and prosecutors. Also keep a record of to whom you reported an incident, his or her title, the time and date you made the report and voilà you’ve done your civic duty. Below are the telephone numbers for each state government office to call about suspicious activity you’ve observed while voting. Courtesy of the National Association of Chiefs of Police. The vast majority of fraternal and labor police organizations have endorsed Donald Trump for President. 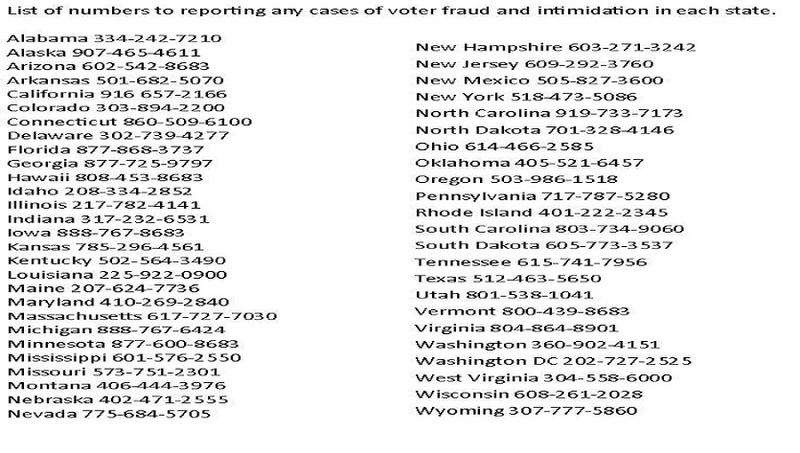 Thank You for listing the phone numbers for voter fraud and intimidation. Thank you so much Jim! This is a much needed list. I also hope people call their County Sheriffs, Let Judicial Watch, Breitbart, Wikileaks (Assange), and James O’Keefe know. Plus maybe True the Vote, and local news. If they won’t cover it, then contact another. I also hope everyone documents their evidences. It will be needed and necessary for proof.